ANY DREAM WILL DO. 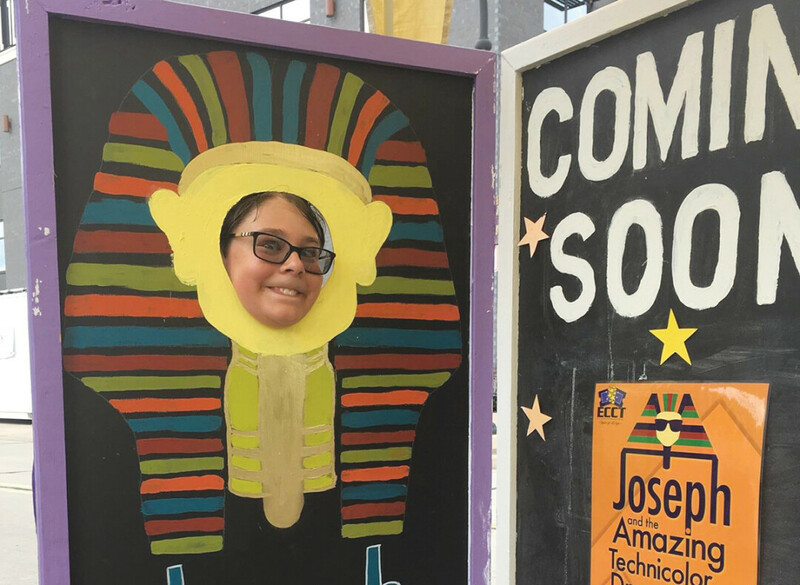 The Eau Claire Children’s Theatre promoted its latest show, Joseph and the Amazing Technicolor Dreamcoat, at the recent Family Day in Downtown Eau Claire. The pages were frail and, with every turn, carried the comforting scent of grandma and grandpa’s home. Snuggled together, in a twin bed, two small girls lost themselves – not in dreams of the night – but in the story of a boy named Joseph and his coat of many colors. Of the many stories told in the book of Genesis, this story was one they cherished most. Maybe it’s because Joseph was young, with big dreams, like them. Whatever the reason, Joseph’s story was more captivating to the two of them than any Cinderella story. For anyone too young to remember the 1982 musical (or if you happened to miss Donny Osmond’s portrayal of Joseph in the 1999 movie adaptation), here’s the story in a nutshell. It begins in the land of Canaan, “not long after the Bible began.” Here lived a man named Jacob and his 12 sons. He loved all of his sons, but Joseph was his pride and joy. Jacob gives Joseph a coat of many colors, which doesn’t settle well with his brothers and only fuels their jealousy. They end up trading their brother Joseph into slavery for a nice chunk of change. Clearly, this is a low-point for Joseph, who’s quite used to livin’ the good life. At the core of every memorable story, there is a cast of great story-tellers. “We’ve done the show three times before in the past,” ECCT Executive Director Wayne Marek said. “Each production has a somewhat different look to it.” For this production, he said, ECCT brought in a lighting designer from the Milwaukee area to add more “flash and trash” to the production. There will be more moving lights, more special effects, and more confetti cannons. “It’s the last community theatre show at the State – we want to make it memorable,” he said. For both Marek and Peterson, the moments they treasure most about performing are the people. The cast is composed of 44 people, including a 37-member youth choir. The remaining cast are college students and adults, many of whom have been in a number of past ECCT productions. “It’s great to see their energy and how hard they’re working,” Marek says. Peterson is honored to have the opportunity to work with such a talented ensemble. He says that the joy of performing on stage is the chance to recreate the story and make it your own. “This whole experience and building relationships with my cast and crew mates has been incredible,” he said. This production will close out ECCT’s 29th season. It is the last community theater production to be performed at the State Theatre before it closes. “I have the honor of being the first and last director at the State Theatre,” Marek said. He directed Cinderella for the Chippewa Valley Theatre Guild in May 1988 to open the State Theatre, which had just been renovated. Now, he’s directing Joseph for ECCT to close it. In what Marek calls “a twist of fate,” he will direct a different production of Cinderella this fall as the first show in the RCU Theatre at the Pablo Center at the Confluence to kick off ECCT’s 30th anniversary season. As a final hurrah, ECCT will be hosting a post-show reception on stage at the State Theatre. The reception begins at 9:30pm on July 28. There will be slideshows, a cash bar, ECCT classic foods, root beer from Northwoods Brew Pub, and ice cream from Ramone’s. Guests will also have the chance to wander the the stage and downstairs one last time. 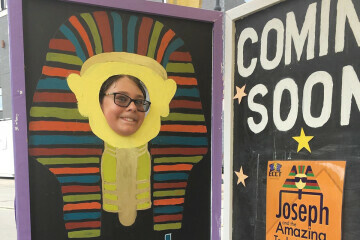 You don’t have to be 6 years old to enjoy the magic of Joseph and the Amazing Technicolor Dreamcoat. It’s a story that reminds us that good things will come as long as we hold on to our dreams and do our best. When it’s told in colors of “ochre and peach, ruby, olive, violet and fawn” it’s that much better.